It's been a while since Sheikh Mohammed bin Rashid al Maktoum has made an appearance at the Keeneland September yearling sale, but he made his presence known in a big way on Monday, buying a pair of seven-figure horses during the opening session of the Keeneland September Yearling sale. The ruler of Dubai and proprietor of the Godolphin operation was in attendance throughout the day with his family, inspecting horses in the barns and the back ring. Godolphin, along with Godolphin Japan, accounted for 11 purchases on Monday totaling $7.28 million, which in one day threatened to eclipse the $8,065,000 the operation spent during the entirety of last year's sale. Year-to-year sessions are difficult to compare between this year's auction and the 2017 renewal due to the sale's select Book 1 being expanded to four days from last year's single boutique evening. However, the five purchases at the seven-figure mark made up significant ground against the eight that hit the mark in last year's first book. Monday's session finished with 138 horses sold for revenues of $48,620,000. The average sale price finished at $352,319, the median closed at $260,000, and the buyback rate finished at 35 percent. Bob Elliston, Keeneland's vice president of racing and sales, acknowledged the impact Sheikh Mohammed's presence had on both the atmosphere of the sale and its bottom line. Monday's session started two hours later than originally scheduled after heavy rains washed out much of Sunday's pre-sale inspection time for potential buyers. Each of the first four sessions will begin at 1 p.m. Eastern instead of the originally-planned 11 a.m., and Elliston said the change has been universally welcomed from both sides of the sale ring. A colt by 2015 Triple Crown winner American Pharoah achieved the highest price paid at North American public auction this year, dropping the hammer to Godolphin for $2.2 million to lead the opening session. The chestnut colt, Hip 91, is the second foal out of the Grade 2-placed stakes-winning Indian Charlie mare Kindle. His extended family includes French champion Play It Safe and Australian Group 3 winner Tonopah. Woods Edge Farm consigned the colt, as agent. The Daily Racing Form reported Coolmore was the underbidder on the colt. O'Callaghan bought the colt as a weanling for $400,000 at last year's Keeneland November breeding stock sale. The colt was bred by HnR Nothhaft Horse Racing, advised by Carl McEntee. “She was a lovely racemare,” McEntee said about Kindle. “She got beat a whisker by Mizdirection [in the Grade 2 Monrovia Stakes]. I wanted dirt speed and classic distance on top, and it just hooked up really nice. $400,000 was a good number for him at the time, and obviously he's gone on an ring an absolute bell. The mare has a Pioneerof the Nile on the ground, so obviously we like that mating. Godolphin rounded out its busy session with the $1.3-million purchase of Hip 218, a Medaglia d'Oro colt out of the Grade 2-winning Curlin mare Moulin de Mougin. He is the first foal out of the mare, from the family of Group 1 winner Roaring Lion. Lane's End consigned the colt, as agent. 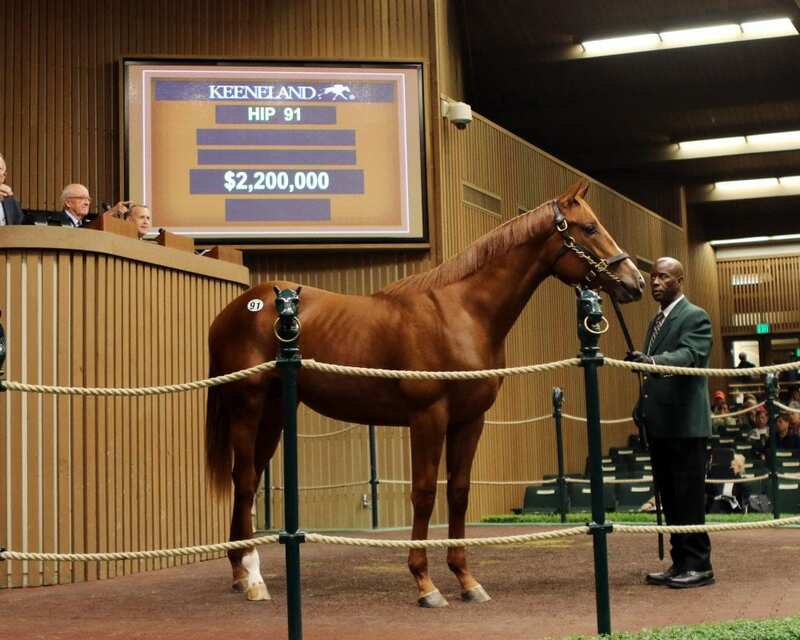 A half-brother to two-time Horse of the Year California Chrome sold to the Coolmore partnership for $1.1 million. The gray or roan Tapit colt, Hip 141, is out of the winning Not For Love mare Love the Chase, who is the dam of three winners from four foals to race. The colt sold Monday was in-utero when Love the Chase sold for $1.95 million at the 2016 Fasig-Tipton Kentucky Fall Selected Mixed Sale. Bedouin Bloodstock consigned the colt, as agent. Next to eclipse the seven-figure mark was Hip 203, a Tapit filly out of the Grade 3-winning Trippi mare Miss Macy Sue who sold to Don Alberto Corp. for $1.4 million. The gray or roan filly is a half-sister to Grade 1 winner Liam's Map, Grade 3 winner Not This Time, and Grade 2-placed stakes winner Taylor S.
The filly was bred by Albaugh Family Stables, which bought Miss Macy Sue privately during her on-track career. Taylor Made Sales Agency consigned the filly, as agent. Shortly after the hammer fell on that filly, Larry Best's OXO Equine went to $1.8 million on Hip 211, a Curlin colt out of the Grade 1-winning Ghostzapper mare Molly Morgan. The bay colt is the first foal out of Molly Morgan, from the family of Canadian champion Wavering Girl, Grade 1 winner Military, and Grade 2 winners Tricky Creek and Parade Ground. Summerfield Sales consigned the colt as agent for Stonestreet Farm's “Bred and Raised” program. To view the full results from Monday's session, click here. This entry was posted in Bloodstock, NL Article and tagged american pharoah, Bedouin Bloodstock, bob elliston, California Chrome, Carl McEntee, coolmore, Curlin, darley, don alberto corp, Godolphin, HnR Nothhaft, jimmy bell, Keeneland, Keeneland September, larry best, Love the Chase, m.v. magnier, medaglia d'oro, moulin de mougin, oxo equine, Peter O'Callaghan, sheikh mohammed bin rashid al-maktoum, tapit, taylor made sales agency, Woods Edge Farm by Joe Nevills. Bookmark the permalink.